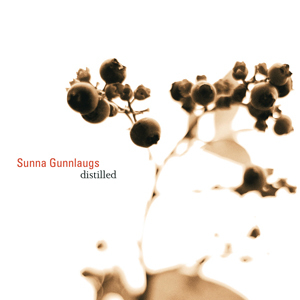 SOME THOUSAND MILES in a South-Easterly direction, Sunna Gunnlaugs’ latest release took its journey to my door (Reykjavik, or thereabouts, to North West England)… and to my heart. The pianist’s new trio album, ‘Distilled’ – with Þorgrímur Jónsson (double bass) and Scott McLemore (drums) – is a masterclass in how to achieve the tricky balance between accessibility and invention; melody and the unexpected; feel-good and mystery. Hailing from Iceland – but also having spent a number of years in the USA and touring worldwide – Gunnlaugs has a catalogue of recordings to her name, the more recent being ‘The Dream’ and ‘Long Pair Bond’. But I am in that happy, exciting position of only now discovering the treasures out there – and this new album, with all but one of the compositions written by the trio’s members, is a great starting point. ‘Momento’ is a lively, brash and bluesy opener – right from the hard-edged drum introduction of McLemore, it promises a satisfaction which Gunnlaugs’ bright piano style confirms, bass adding the bounce. Title track, ‘Distilled’, presents a homely, melodic piano line and the shared trio aim of creating an easy-going countrified appeal, whilst also possessing an agreeable edge of uncertainty. The anarchic swagger of miniature ‘Switcheroo’, with its slightly inebriated manner, is a delight, the rhythm intentionally taking its time to find its feet, but building towards a more steered, octave-driven (cheeky, even) piano lead… before dissolving once more into further random acts of brilliance. ‘Smiling Face’ is aptly titled – a sweet, unpretentious piano tune (shades of Bill Evans) in which Jónsson takes up an articulate bass solo, McLemore fluttering delicately through a battery of cymbals and brushed snare. Cantering steadily in, and gradually picking up the pace, is one of the album’s real gems – ‘Gallop’. It has an affable air which then develops the same kind of abandon that characterised the more playful pieces of the late, great Esbjörn Svensson. Very attractive indeed. The two short, freely-improvised numbers, ‘Spin 6’ and ‘Spin 7′, reveal the band members’ empathy with each other, the latter’s sensitivity suggesting (to me) an early-morning creaking ‘frostscape’, sun rising to wake the day. ‘The New Now’ is so ‘together’, Gunnlaugs’ delicately propelled soloing shining above the equally sprightly rhythms of drums and bass, leading to the sonorous, meandering bass introduction of ’24H Trip’. This exquisite seven-minute jewel, with a gentle Bachian feel reminiscent of John Lewis’s renowned MJQ recordings, finds writer Jónsson in great form, creating a slightly disquieting undercurrent, and McLemore contributing atmospheric rumbles and shimmers. Based on an old Icelandic melody (‘Lóan er komin’), Scott McLemore’s ‘Things You Should Know’ provides the pianist the space to state and then expand lucidly on the folksong charm, its simplicity never overblown by her colleagues. Paul Motian’s ‘From Time to Time’ is a brief yet alluring rendition, the expressive openness of the interpretation a real pleasure. Equally spacial is ‘Opposite Side’ – one of Gunnlaugs’ four compositions here – its late-night mellowness and inquiring bass suggesting the merest hint of melancholy. With so much warmth and colour emanating from this beautiful production, ‘Distilled’ is certainly much more a case of Aurora Borealis than Icelandic Low. Since its arrival, the CD has barely left my player, such is its charm and breadth of interest – and I sense it will remain close for a long time to come.